Valentine’s Day is all about love and, well…we love margaritas. So on this heart-filled holiday, typically associated with candy and sweets, we wanted to marry our BAE (margaritas!) with a more traditional treat. Sweet, salty and delicious, these cookies will have you saying Te Amo and Te Quila. Beat butter and granulated sugar in large bowl until light and fluffy. 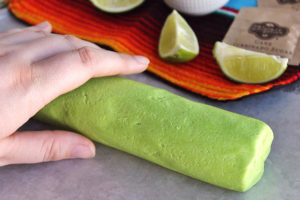 Add egg, lime peel, and food coloring; mix well. Gradually beat in flour, gelatin and salt on low speed until well mixed. Divide dough in half. Form each half into a log about 9 inches long and 1 1/2 inches in diameter. Wrap in wax paper. 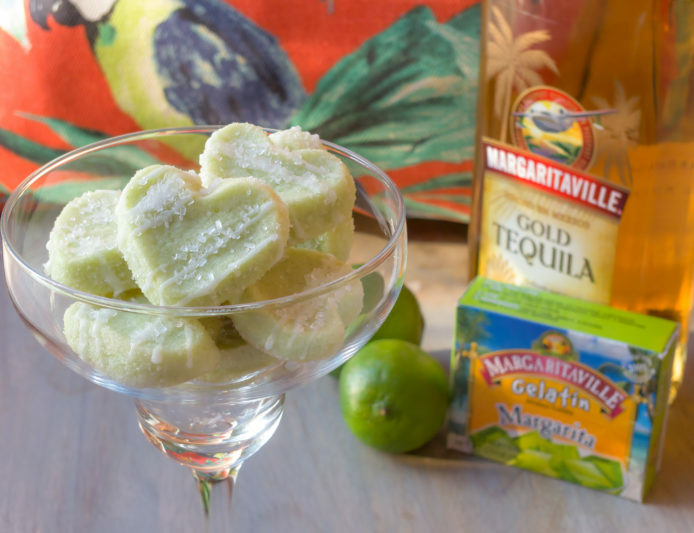 Pro Tip: Double the batch and freeze a full recipe for National Margarita Day on February 22! Preheat oven to 350°F. Mix ½ cup of sanding sugar and kosher salt together. Roll each cold dough log in mixture to coat evenly. Cut dough into 1/4-inch thick slices. One recipe makes approximately 3 dozen cookies. If you prefer heart shaped cookies instead of round cookies, use a heart cookie cutter at this time before placing on the baking sheet. Place on ungreased baking sheets. If desired sprinkle a bit of additional sugar and salt mixture on tops. Bake 12 minutes or until lightly browned around edges. Cool on baking sheets 1 minute. Remove to wire racks; cool completely. To create the tequila glaze, mix 1 cup confectioners’ sugar, and 1 tablespoon each water and tequila in small bowl until smooth. Drizzle glaze over cooled cookies. If desired, sprinkle lightly with additional sanding sugar. Let stand until glaze is set.